It's a strange day for sure when Bruton Smith is all but speechless. The legendary stock car promoter and major league car salesman (237,000 vehicles sold in 2012) would never drop the mike. And he's not above shushing rivals. Still, when Smith appears in front of a crowd, he's usually there to make some headlines. Or at least to raise questions about what might really be going on behind the scenes. Day Two of the annual preseason Charlotte Motor Speedway media tour, and it was Smith's turn on dais, along with his army of track promoters. Las Vegas' Chris Powell. Bristol's Jerry Caldwell. Kentucky's Mark Simendinger. New Hampshire's Jerry Gappens. Atlanta's Ed Clark. Charlotte's Marcus Smith. Sonoma's Steve Page. And Texas' Eddie Gossage. Each had a promotional angle for his upcoming Sprint Cup race. Gossage is now offering a discount on tickets to any fans inconvenienced by a rainout, and Caldwell is giving away 10 Mustangs (cars, not horses) to fans. Smith had two items on his own agenda for the public to debate: his continuing campaign to get NASCAR to slow its stockers in order to put on better racing, and a new campaign to eliminate 'start and park' teams. "I know beyond a shadow of a doubt -- because I've been in this game several years -- that if we slow these race cars down, they will be more competitive and the races will be far superior to what they are today," Smith declared. NASCAR did test that idea here at this 1-1/2-mile track a few weeks ago, using the Truck tour's engine-choking 'tapered' carburetor spacers. That slowed corner entry speeds considerably, but mid-corner speeds were up. And so far NASCAR has made no move to put that speed-cutting option into effect on the Sprint Cup tour. So Smith is repeating his bid. Smith's track bosses have just finished a big survey of fans. And each man offered good stuff to appeal to fans. Indeed, NASCAR's many track promoters have been working extremely hard the past few years to drum up business, during the economic downturn. "We've got to do better and better for the race fans, because they pay the tab," Smith points out. Certainly. And that is a big theme in this media tour. However the biggest problems with NASCAR racing today aren't ticket prices and promotions. The three biggest problems facing this sport right now are exorbitant hotel rates during race weekends, too much terribly boring racing (and inanely boring qualifying), and outrageously expensive costs for fielding a top stock car team. And little this sport's executives have offered this week so far has done anything to address those three problems, except for Smith. NASCAR execs seem to be banking so much on the new 2013 stockers as the sport's saving grace. The Phoenix and Las Vegas races, just weeks away, are shaping up as major question marks, because there has been virtually no legitimate, extensive testing of the 2013 cars on such tracks. No one knows if one make will display startling strength over rivals, or if one team has made any major breakthroughs, or how Goodyear's tires will handle. Maybe the uncertainty will excite fans. But the specter of Las Vegas 1998 hangs here -- remember that debut of that new Ford, and the runaway, which sparked such controversy. And it's curious the handling of the planned test of the 2013s at Las Vegas Motor Speedway. That test has been essentially cancelled by NASCAR. Teams will instead be given Thursday of race week at that track for testing. For such a significant change, that is unsettling. Or is there more at play here? Such tests are hot button marketing tools for a track. Phoenix got a test last year that appeared more a ticket promotion than great testing opportunity. Why did NASCAR not plan back-to-back tests of the 2013s at Las Vegas and California, which both feature key early season races, two tracks only three hours apart? That would clearly appear to be a major missed marketing opportunity for this sport and these 2013s in the major Southern California market. -- and to try to cure this run of dismally boring races, cut speeds by a bunch at big tracks, and add three or four strategically placed TV timeouts during each Sunday, have TV package their commercials in these blocks, and let the 'timeout' cautions re-bunch the field. Of course there are a number of other things the sport's bosses could do too. Like eliminating two-lap qualifying in favor of heat races on Fridays, and women-get-in-free on Nationwide Saturdays. So how about free hotel rooms for the fans? Offered to generate a response. "Great idea! With a bottle of wine," Smith replies with a grin. Smith well realizes hotel rates are way out of line and hurting this sport, particularly in some places, like Bristol, Tenn.
"Maybe we should start building some hotels ourselves," he suggests, tongue in cheek. "We can't control hotel prices. But hotel prices are our biggest complaint." However there has been the sense in some quarters that the long-running battle between this sport's two most formidable powers, the France family and the Smith family, which dates back decades, may be heating up again. The France family not only owns half the tracks in this sport it also owns the sanctioning body, and the umpires who make the calls on balls and strikes. Is this battle heating up again? Bruton Smith and the late Bill France knocked heads for years, over just about anything. Their battle over Texas Motor Speedway was historic, with Smith insisting that France had 'promised' him a Cup date if he built that now famous track, and with France denying that. The whole thing went to court, in a strange battle, before finally getting resolved. But when France, around 2003, became ill and had to turn things over to Mike Helton, Brian France, Lesa France Kennedy (all of course serving the sport's majority stockholder Jim France, the real power behind the scenes), Smith quickly took the edge off his serves and made very nice with the new command. And Smith has been reluctant to criticism the France family. He still is, but here he seems to be stepping up the heat a notch. After all, he's got a lot of 1-1/2-mile tracks, which are handling monsters. And precious little testing so far. 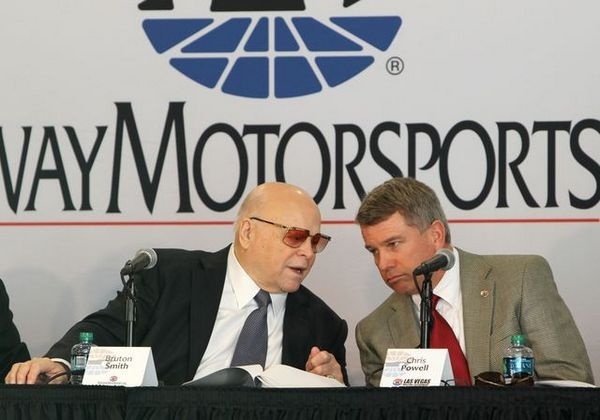 Meanwhile back on the dais Tuesday afternoon, journalists peppered Bruton Smith with openings, but couldn't get much of a bite. Maybe it was an off day. Maybe he really had other things on his mind. Maybe this was just set up as perfunctory media event. Still, the legendary stock car promoter is usually up to a good battle. Not today, for some reason. Just hours after a NASCAR media session with the sanctioning body's executives (who themselves had little to offer), Smith had a media session of his own. Smith used some of that time to complain about 'start and parks,' the backburner teams that have taken advantage of this sport's weak economics the past few years to 'start and park,' accepting lucrative last-place money. Smith rightly decried the start and parks. "It's a disservice to our sport. We're in the racing business, not the start and park business. "We've got to stop this. Shorten the fields is one way. But it's up to NASCAR, not me. "But it's a joke, a joke to the race fans. "However it's lucrative. You and I could go get a car and start and park and make about $2.5 million a year." However that really isn't a burning issue in the sport at the moment, more an indication of the radically high cost of fielding a decent race team. This sport's general economics are vastly out of kilter with reality. Tony Stewart just announced he's still looking for sponsorship for nine of this year's 36 races for his team, and sponsorship for eight races for teammate Ryan Newman. Stewart, despite winning the 2011 championship, in dramatic fashion, lost his primary sponsor just a few months later. And a big question which the sport's bosses seem to too easily ignore is the question of where to find new, solid team owners, or anyone new interested in coming into this sport. If you were a modestly wealthy businessman, and wanted to play the NASCAR game, and race against giants like Rick Hendrick and Joe Gibbs and Jack Roush, well, you'd have to be almost crazy. Even solid, established team owners, like Chip Ganassi and Richard Childress struggle. Smith agrees that racing is very expensive and says "it's up to our sanctioning body to do something about that. And they do. Maybe they should work harder to reduce the cost of these cars." -- NASCAR officials have raised the idea of some 'exhibition' races in Europe. Details are unclear. Reasoning is unclear. Financing is unclear. Timing is unclear. The whole thing is quite curious. Remember Smith was once very interested in an oval race track in eastern Germany. And Smith has been talking about building a copy of Germany's famous Nurburgring road course out in the Nevada desert, as a year-round test track for car makers. Heck, Smith could easily buy the real Nurburgring if he wanted, for a pretty cheap price, though he says he's not interested. And Smith easily dissed NASCAR's European gambit: "Why would they do it? You can't take what we have here and go to Europe with it. "We looked at it really, really hard one time. But you won't find a Charlotte Motor Speedway in Europe. There's not one there. "Mainly they have road courses. "NASCAR going to Europe does not make sense. "You talk about expense. It doesn't work." But maybe one of the NASCAR manufacturers might be interested in making a European pitch. After all Ford-Europe, Smith says, is bigger than Ford-America. "Maybe you didn't know that," Smith said. But then Europe isn't exactly brimming with general economic confidence these days. Well, if Smith isn't buying into any European venture, what big project might he be interested in. Smith's own plans for a new Nurburgring. "We've got to get back on that. I've got to get out to Nevada and talk with the governor," he says. "We've got to get with him and get it moving. "We've got to work harder with what we've got. We've got a lot of stuff..."
-- How about repaving Kentucky Speedway, opening the way for an Indy-car race there? Smith easily dissed this idea too. "No." It would take away that track's character. And Smith has little interest in Indy-car racing. -- Charlotte taxpayers are about to be billed $125 million so the local privately owned NFL football team can expand its downtown stadium. Hey, why hasn't Smith asked the city for $100 million or so himself, to improve Charlotte Motor Speedway? NASCAR itself even wrangled a big deal with the city. Looks odd that Smith, a businessman right here since the 1960s, hasn't gone to that trough himself. "We're not in the city of Charlotte....but we'll find somebody to ask," Smith said with a grin. "We'll ask somebody. I hate to see that money passing us by." --Any progress on his bid for NASCAR to add 'competition cautions? No. -- Any more talks with Goodyear about 'softer' tires, for better racing? No. What's Smith takes on the new 2013 NASCAR stocker and how it might help boost his own dealership sales? He's rather noncommittal, and says he's "not too excited about it. "It will be a positive, but it's not that big. "Way back when, the line was 'win on Sunday, sell on Monday,' but I'm not sure it had that big of an effect on car sales...though it sounded good. "But race fans are going to appreciate the new car." However Smith concedes the new sheet metal won't solve the contentious issue of outrageous hotel prices on NASCAR weekends. "No, it won't solve that. It sure won't. "But I hope you will study the issue of slowing these cars down. I am convinced that will make this racing better. "You can't resolve that by committee. It comes down to making a decision. And it will come down to Brian making that decision. It would take me about 10 minutes to get it done. "History will tell you when you slow them down, it makes racing better." Submitted by Mike Daly on Tue 01/22/2013 - 17:50. 1 - Yes, the cars need to be slowed down, and I am baffled NASCAR isn't yet using the smaller spacers. The Charlotte test showed promise. 2 - The start and park issue is one of the sport's lack of cost and spending controls and the absurdity of its purse structures. Bruton, you remember what Dave Marcis always told you - "Pay a better damned purse." You'll help with the start and park issue if you do. And the sport needs to start reigning in the spending by teams so costs come under control and the "start and parks" can race. 3 - Hotel prices is a market issue - supply has to outrun demand before prices come down. 4 - The Generation 6 car is not something to appreciate. Give us back the long lean aerocoupe bodies; go back to the big spoiler and make it out of clear-view bulletproof plastic so drivers can see through it; give us back the roof blade to make the draft work again. Submitted by Fireball Roberts on Tue 01/22/2013 - 21:12. 1) "-- cut team expenses by cracking down on the sport's mega-team owners and force them to cut back to just two teams each...and insist on no entangling 'engineering' subsidiaries, no engine sales, no chassis sales, period; "
----------Like this idea Mike. The worst perps are Stewart-Haas, aka Hendrick North. How can it be a "separate" teams when the only thing on the car not made by Hendrick are the tires and decals? 2) "-- and to try to cure this run of dismally boring races, cut speeds by a bunch at big tracks, and add three or four strategically placed TV timeouts during each Sunday, have TV package their commercials in these blocks, and let the 'timeout' cautions re-bunch the field." ------I don't think this will make the racing any better Mike. I think this would lead to most of the drivers "riding around" for most of the race knowing that the house caution is coming. NASCAR throws "debris" cautions now when the cars get spread out, which only penalizes the guys actually running hard. The big tracks are the main problem. They allow for more riding instead of racing because of their size. You can't "ride" at Bristol, Richmond, Martinsville, or Dover, or you'll get lapped. Don't manipulate the races NASCAR, and quit throwing "debris" cautions when clearly there isn't any to be found. 3)"and women-get-in-free on Nationwide Saturdays." ---Good idea, but I prefer they fix the series first. The Cup guys not getting points in the lower series was a good start, but the next step needs to be that they can only run 5 races in either of the lower series, and that a maximum of 5 Cup drivers can be in any given field. I would prefer they not run the lesser series at all, but NASCAR isn't going to do that. They do need to realize that the Nationwide Series, err Cup Lite, is not appealing to watch or attend. The Cup drivers take potential sponsors away from potential full time Nationwide owners, and more importantly they take away seats from up-and-coming drivers. I don't even bother watching the races anymore, even at the tracks that produce good racing. The truck series is by far the series with the best racing, and there is a good reason why: less expensive to field a competitive team and fewer Cup drivers. 4) Start and parkers are a problem, but the only way to fix it is too lessen the field size, or cut the cost of having to field a competitive car so that there are more than 30 teams that are indeed competitive. They've finally got rid of the Top 35 provisional nonsense, now the next step is to get rid of all provisionals and make everyone race their way in. Start and parkers would have to race then, and those that don't qualify would only get their tire bill paid for and nothing more. No more starting and parking then. Submitted by paul watson on Wed 01/23/2013 - 12:27. FIRST... Qualifing should be the average of 10 laps with 5 cars on track at one time.That would add some excitement in qualifing.Also if you sit on more then 4 poles before the chase starts you are awarded 1 championship point.Sit on 3 poles in the chase and you get 1 championship point.That way if you have a bad race in the chase this will give you a a way to get back into the hunt. SECOND...if you are the leader at half way in 3 straight races you are awarded a championship point..Everyone will have to drive hard and it rewards teams for doing so. Third... Do we want a format that discourages new teams like f 1 does.Thats what will happen if we do away with lesser teams or start and parks. The way around start and parks is they have to complete at least 100 laps to be awarded money and points if not in the top 35 in owner points except when involved in wrecks or blown motors. forth... Every team draws for a pit stall including the champ.qualifing spot shoulden\'t provide your pit stall. fifth...all qualifing should determine the field.If the 48 wrecks in qualifing and isn\'t fast enough then he goes home.If the 88 blows during qualifing he goes home.If the 18 isn\'t fast enough he goes home.Giving a heavly sponsored team a bye is a joke in itself.What you did the yr before should not wain into the previous yr.Thats the way every dirt track across the country does it. Can you imagine the exposure of the 48 not being in the race by missing qualifing.Jr watching from the pits on race day. The famous 43 not being in the daytona 500. That would make qualifing everything.Do you want to go for 4 poles and gain a point or take a safe route and not charge as hard.That would put excitement into every aspect from friday qualifing to sundays race.Nascar doesn\'t need to cut speeds switch to tapered spacers or have phantom cautions.They have everything above to make racing exciting.